In this post I want to show how you store and query JSON data straight in the database. You see the data I get back is actually two records as I actually get back the JSON array. Note that the array start with 0. 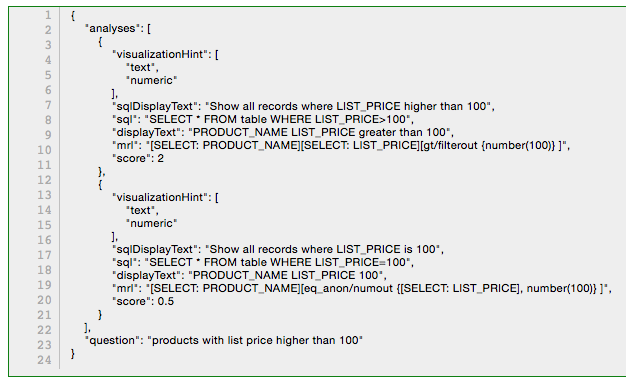 The above is just a grasp of what you can do with JSON directly in the database (12c) by using SQL. If you're interested to read more about how to manipulate JSON in the database, have a look at the documentation, it contains a wealth on information with great examples. As you can basically query the JSON with SQL you can use this SQL in your APEX reports... in the coming days I'll show you a real case where I used the above techniques to do some interesting searching in data. But there is no JSON function in Oracle 12c function list! Also there is no such a name in all_objects and all_synonyms! Not sure where you saw I did JSON() in my example? In your table you define a CHECK CONSTRAINT CHECK IS JSON. Check your object types to verify. 00904. 00000 - "%s: invalid identifier"
i am trying to integrate RESTfull services with HTML 5 or MAF (Mobile Application Framework) is it possible to do in such a manner that i can access all my data of oracle Apex 5.0 in MAF or HTML5. Thanks for your many helpful posts related to APEX. I have an apex application where currently I'm getting a csv file from another group and uploading it in to a table on my schema daily. I'd like to automate this using REST services. 1. which method would be recommended from the APEX side: a GET to pull the JSON or POST to receive the JSON? If you've already posted about this in another blog I apologize and would appreciate a link to said post.